Awhile ago, a package mysteriously appeared from Brownells with my name on it. Receiving a package from Brownells is not an unusual event around Casa del 1911, but I had received an order only a few days before, and there weren’t any items from that order on backorder. Curious, I opened the box, to discover nestled inside … another box, which had no identification on the outside other than a piece of paper torn from a yellow legal pad with what appeared to be a Brownells’ stock number scribbled on it. There was no invoice or shipping order anywhere to be found. Inside the smaller box, I found a small reflex sight, along with some accessories. I certainly hadn’t ordered this. My memory may slip, but it would be unlikely that I would forget having ordered something unrelated to a 1911, and for which (at that time) I didn’t have any need. Indeed, a mystery. Perhaps not worthy of Agatha Christy or Ellery Queen, but a mystery nonetheless. On occasions too rare for my taste, events sometimes come together in a fortuitous manner. This turned out to be one of those occasions. 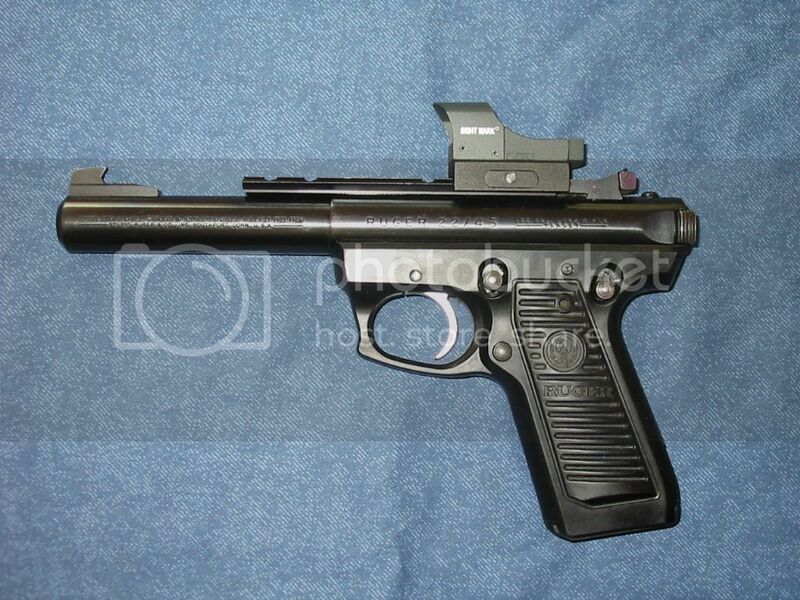 For may years I have owned a Ruger 22/45 .22LR pistol, with a bull barrel and adjustable, target sights. However, I virtually never shoot it. I don’t like it, it doesn’t feel at all to me like shooting a 1911, and I have a dedicated .22LR 1911 that I built using a Ciener conversion kit and a bargain basement, no-name receiver. When I’m in the mood for cheap plinking (not that .22LR is cheap these days – or even available), I turn to the 1911 rather than to the Ruger. That said, there has been some talk at the range where I shoot of starting a bullseye competition in addition to the weekly “combat” shoots held on Thursday evenings. My bare-bones Rimfire 1911 is hardly competition grade equipment. The receiver was thrown together using left-over parts from other projects, and the Ciener upper is the basic model with fixed sights. As a result, I scrubbed my plan to sell the Ruger and resolved to try it if the bullseye competitions become reality. Then came the recent test of Bill Wilson Signature Match ammunition (http://ezine.m1911.org/showthread.php?t=171 ), a test for which I enlisted the assistance of a friend who is a dedicated bullseye competitor. I was surprised to see that one of his two competition pistols was equipped with a red dot scope. When I asked him about it, he said that “Most of us older guys are using these now.” I was even more surprised to discover that there is no rules penalty for using them – shooters using red dots compete head-to-head against shooters using open sights. With that in mind, I procured a genuine Ruger sight rail made for the 22/45 and dropped my pistol off to have the rail professionally installed. The serendipitous confluence of events was that the Sightmark Mini Shot Reflex Sight materialized while my pistol was having the rail installed. Once I got the pistol back, I would have a viable platform for testing the sight. My Ruger returned from its hiatus a couple of weeks ago, so I have finally had an opportunity to put the Sightmark Mini Shot Reflex Sight through its paces. Overall, there isn’t much mystery about an open, reflex sight. Like all such sights, the Sightmark Mini Shot is a small unit with an upright “tombstone” viewing lens rather than a conventional tube. The basic unit incorporates the reflex sight itself and a mounting base for a Weaver rail. Brownells’ web site describes the rail mount as “built-in,” which I initially thought to be technically incorrect. The sight is attached to the Weaver mount in the box, but the mounting base does not appear to be an integral part of the sight. The sight attaches to the base with two recessed Allen-head screws, and the package includes an Allen wrench that fits these screws. More about this later. 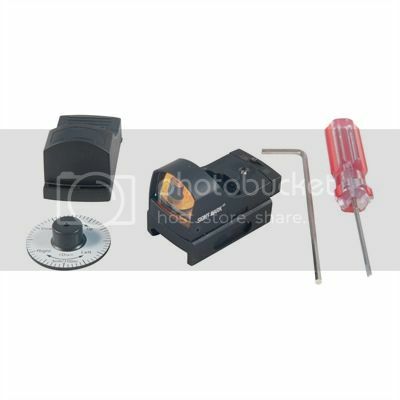 The package also includes a tiny screwdriver whose tip fits the adjustment screws, a snap-on rubber sight cover, and a small dial that doesn’t appear to fit anything. The sight itself is not marked in any way to indicate which way to turn the adjusting screws to move point of impact in the desired direction. The wheel provides this indication, although anyone who has ever adjusted sight will probably not need it. I had the sight zeroed before I discovered the dial hidden in the foam packaging, so it clearly isn’t essential. The sight attaches to a Weaver/Picatinny rail with a single set screw that can be manipulated without tools. Mount it up, and proceed to adjust so that point of impact coincides with point of aim. So far, I have left the sight attached to the rail on my pistol. While I fully expect that it will return to zero if removed and reinstalled, I have not yet tested this. Operation is extremely simple. There is no choice of reticle; it’s a single, 3 MOA dot. At the rear of the unit is a small slide switch with three positions. All the way to the right is OFF; the center is low brightness, and all the way to the left is full brightness. When I read the description of the Mini Shot, it said the Weaver mounting base was integral to the sight. Looking at the sight, the base appeared to be a separate adapter, to which the sight attaches with two recessed Allen screws. Initially, I had visions of being able to separate the sight from the base and mounting the sight directly to the slide of a 1911 (after milling a suitable flat surface into the top of the slide). That idea went away when I wondered where the battery goes. There is no nickel-sized battery cover on the top of the sight, as I am accustomed to with tube-type red dot scopes and as I have seen on some other reflex sights. Puzzled, I used the provided Allen wrench to remove the sight from the base. Doing so revealed the battery compartment, which houses a single CR2032 battery. But … there isn’t any battery cover hiding in there. The mounting base IS the battery cover. While it might be possible to conjure up some way to mount the sight directly to a slide without the base unit, the Mini Shot clearly was not designed to be used or mounted that way. That’s it. Now let’s look at how it performed. For zeroing, I shot the Sightmark Mini Shot using my customary two-handed grip. Because this type of sight seems a natural for bullseye shooting, and because I was evaluating it with that type of competition in mind, once I was satisfied that I had it “dialed in” I changed to a one-handed grip to see how it would affect my shooting. Many readers of this review will already know from previous articles that I am a senior citizen. As is often the case with us “geezers,” my arms have been growing progressively too short for my eyesight … which, of course, is a vernacular way of expressing that I am experiencing the progression of presbyopia, which is difficulty in focusing on objects near to the eyes. Unfortunately, as presbyopia progresses, the affected distance increases to the point that focusing on the front sight of a handgun becomes difficult. And this is why so many bullseye shooters are embracing reflex sight (or red dot sight) technology. “Run-n-gun” practical shooting competition such as IPSC and IDPA don’t require pin-point accuracy, plus they are usually shot outdoors where brighter light helps overcome deteriorating visual acuity. Many bullseye matches are shot outdoors, as well, but there are also a lot of bullseye matches that are shot indoors, where even good lighting doesn’t approach the brightness of outdoor sunlight. The best of traditional, adjustable sights simply aren’t much help if the shooter can’t get the front sight into sharp focus. I don’t practice wearing reading glasses, but the fact is I can see the front sight a lot better indoors if I don a pair of drugstore magnifiers with a diopter (magnification) of about 2x. I don’t practice with them because I don’t wear them on the street and I see little value to practicing using a visual aid I won’t have available if I ever need to use a handgun to defend myself. However, bullseye competition is a different story. You can’t even get into the game if you can’t see the sights. There’s no point shooting or center-of-mass involved in bullseye shooting. For indoor, fifty-foot competition (which seems to be somewhat the prevailing discipline in my neck of the woods), the black on both the slow-fire and the timed and rapid-fire targets measures 3-1/16 inch in diameter. (The difference is in the size of the ten ring within the black.) White dots, fiber optic tubes, and self-illuminating sights don’t provide the degree of accuracy needed to be competitive. You need to be able to see the tip of the front sight blade and to place it perfectly and repeatably on the exact same spot on the target – every shot. If your eyes can’t focus clearly on the front sight, you’re already behind the curve. 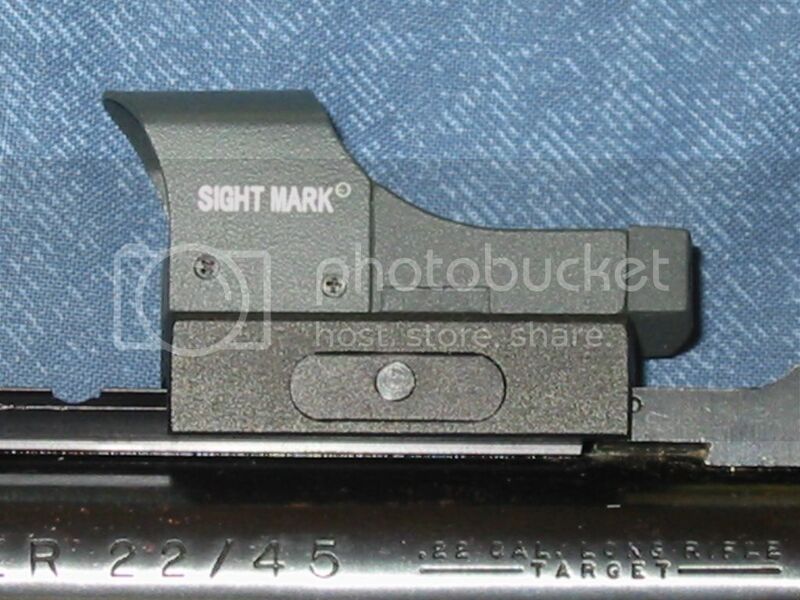 Using the adjustable open sights on my Ruger 22/45, I have no trouble keeping a full magazine of ten rounds in a decent group within the black. But just being in the black isn’t good enough to be competitive in bullseye competition. On the slow fire target, the black includes all the way down to the 7 ring. On the timed and rapid fire target, the black encompasses the X ring, the 10 ring, and the 9 ring. To be competitive, you need to be cutting one-hole groups, and that can’t be done if you can’t see your front sight. With the Sightmark Mini Shot mounted to my pistol, I entered a completely different universe. The Mini Shot is available with either a red dot or a green dot. My vision is red/green weak, so red dots are sometimes less than useful for me. Thanks perhaps to a confluence of favorable astrological aspects, the sample Brownells sent us for evaluation happened to be the green dot model. The dot stands out sharp and clear. Indoors I don’t even need to use the higher brightness setting. The dot is specified as covering 3 MOA (minutes of angle). For all practical purposes, 1 MOA equates to 1 inch at 100 yards, so 3 MOA is 3 inches at 100 yards. This means the dot would not completely cover the black on a 50-foot bullseye B-2 or B-3 target until the target is pushed back to 100 yards. At 50 feet, 3 MOA covers only 1/2 inch, allowing a shooter to place the dot very precisely in the center of the black. The Mini Shot performed flawlessly. Regrettably, I can’t say the same for myself. I last shot bullseye type competition in either 1967 or 1968. Since then I have trained almost exclusively using a two-handed grip. Getting back in the groove for shooting duelist style is going to require time and practice. One practical aspect of the shift to a reflex sight (any reflex sight or red dot scope) is that sight radius no longer exists. 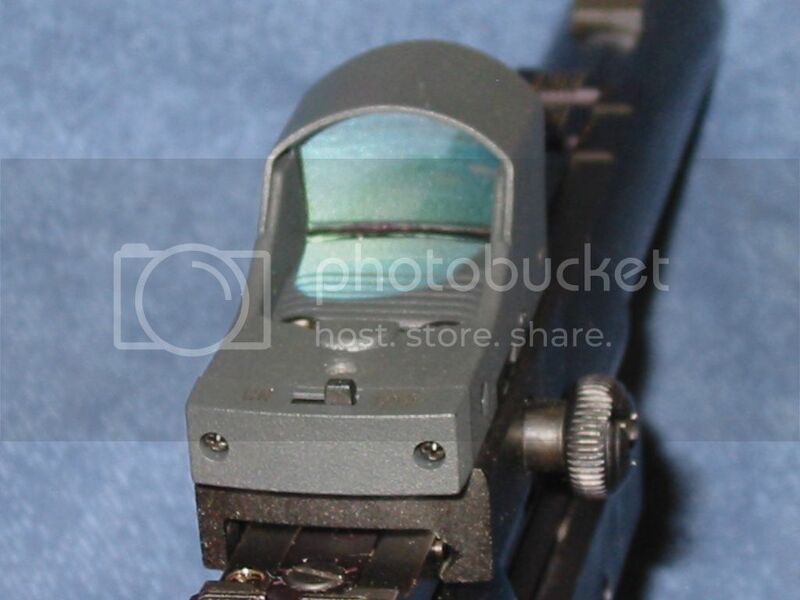 There is no front sight to align with the rear sight, there is only the dot. Place the dot on the target, and pull the trigger. The problem is that, until you become accustomed to the dot, it tends to accentuate how much your hand moves or shakes while aiming. Shooters who have used laser aiming devices have experienced the same phenomenon. We have seen reflex sights offered in various catalogs and on-line for as little as $39 and for as much as $300. At $79 for the red dot version and $99 for the green dot version, the Sightmark Mini Shot falls toward the more affordable end of the spectrum. Coming with Brownells’ backing and at a price point high enough to suggest that this is not one of those products coming out of a single off-shore factory with any of a dozen different brand names on it, we believe the Mini Shot is a quality unit that is worth its price, and perhaps worth quite a bit more. We are looking forward to putting the sample unit through more extensive, long term testing. If we can figure out a way to mount it to a 1911, we’ll also look at how well it withstands the abuse of .45 Auto recoil. M1911.ORG is grateful to Chris’ Indoor Shooting Range for making the facilities available to us while we evaluated this product. Many thanks to Brownells, Incorporated, for providing us with the sample unit for evaluation. You may discuss this article here.